I actually get this question a lot. Since XSL is executed on the server less data is getting passed over the wire and a beefier machine (hopefully) is doing the processing. The outcome of course is better performance. When You are using jQuery and making Web Service calls you are building XML strings and sending them to the server. Then ALL the results come back and the client machine has to parse through the XML and use what it needs and ignore the rest (and there is a lot of garbage that comes back from SharePoint Web Service calls). Thanks again for the input Marc. As always, thanks for stopping by, hope you learned something new. I agree with Marc's point. XSL just converts xml to html, and you still need to send it over the wire. Whether there is garbage or not just depends on how well you did the data retrieval part. I agree with Marc too, I am trying to make the point that if you rely on the client to retrieve hundreds of rows of data, do calculations on that data, and then build the html (all in the client) it's going to be slower than doing a DataViewWebPart that does the same thing. Again, with the caveats added. Every developer needs to understand there will always be exceptions, but learn the 80% first and be accepting when the 20% comes around. If you try to master it all at once, you will not be a happy camper. - XSLT: retrieve data; transform to html; send hundreds of rows of html. 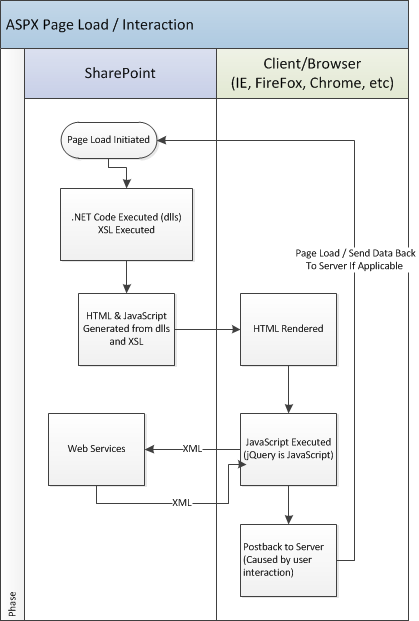 - jQuery: retrieve data; send hundreds of rows of xml; transform to html. I think what you're missing is that with jQuery you send less html with the page, because the html will be built directly in the browser. Of course, if your purpose is just to show aggregate information (e.g. number of tasks due next week), then XSLT processing will be better. But in standard cases where you display list items, there is no real gain (basically it's just about sending table rows vs. xml rows over the wire). XSLT - Retrieve hundreds of rows of data (on the server) transform the data to html (on the server) and send less data across than if you had sent the raw XML for a SharePoint Web Service call. I'm NOT saying jQuery is never faster, or even not often faster, but there are MANY instances where your get much better performance. What's obvious in your example is that your Web service call returned a lot of garbage. I assume this is the point Marc was trying to make. With a clean Web service call, you'll just return what you need (the title). I see. So now it's my turn to say that if I were more ambitious I would definitely dig into this... or forward the question to Marc ;-). I agree that if parasite metadata are returned it's not really cool. 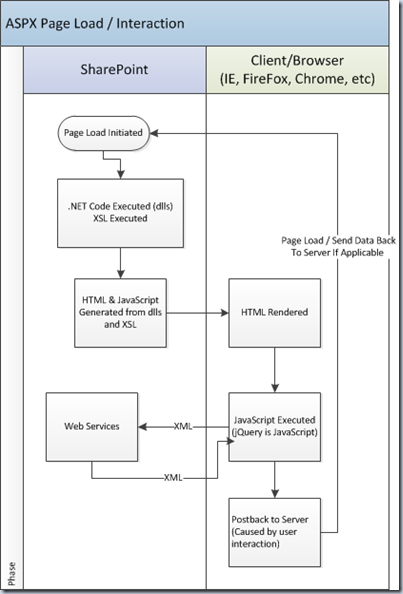 For the record, I often use jQuery with other standard data retrieval methods - owssvr, RSS, or REST (in SP 2010). AFAIK they don't have the issue you're reporting with Web services. For example the image rotator featured on my blog is built on owssvr.